See photos. This is truly a top of the line cantilever. 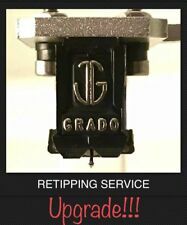 Grado Prestige Series 1/2” Mount or P Mount retipping and UPGRADE service. See photos. This is truly a top of the line cantilever. In other words—the Grado you always knew your Grado could be. I know these are big claims, but this cantilever and stylus combination just works for Grado. But it unleashes Grados, particularly the wood bodied models starting with the Reference Platinum. Tested and works and sounds great. Both the Silver2 and Gold2 use a four piece OTL cantilever with a Grado specific elliptical diamond stylus mounted on a brass bushing. With the Silver2 and Gold2, a machined turned generator is used to achieve a lower distortion and greater transparency. All Prestige series styli are compatible; any of these styli will work in any Prestige body. All the Styli. Green, Black . Red Blue & Silver Styli. Rega Stylus Guard Protector (Original Rega Part). Please refer to pictures for condition and description. Selling as is no returns. 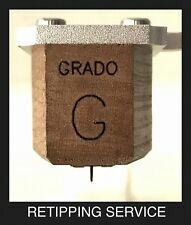 GRADO PRESTIGE GREEN 1 MOVING MAGNET CARTRIDGE NEW! GRADO PRESTIGE GREEN 1. When an item is listed "as is" I do our best to describe the item, but cannot be held responsible for any issues with the item due to age or condition. So read carefully. I will assist every way I can to get your money back. If it has fifty hours use that is saying a lot since I always have rotated my treasures. This one has not had much use so it is practically a hand picked cherry as new an MCX as you will find. This is my opinion. Which is Grado Ft upper quality for bright sound. and once with stylus on and still reproduce good sound. Which is Grado G upper quality for warm sound. and once with stylus on and still reproduce good sound. An indication that your stylus needs replacing and is getting worn is generally a duller sound. Rega Stylus Guard Protector (Original Rega Part). Stylus Cleaners. Valve and Tube Essentials. All in One Music Systems. People who own this Gem and like to enjoy it more, then this Retip Service is for you! If it has fifty hours use that is saying a lot since I always have rotated my treasures. This one has not had much use so it is practically a hand picked cherry as new a 10MR as you will find. This is my opinion. The Blue 1 uses a four piece OTL cantilever technology, standard oxygen free wire in the coils and Grado's specially designed elliptical diamond mounted on s brass brushing. Headphone Amplifiers. Speaker Stands and Supports. 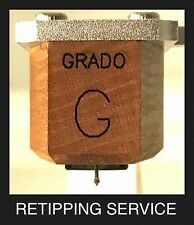 GRADO GT CARTRIDGE STYLUS IN ORIGINAL BOX! Nice Excellent Condition! In mint shape in the box! If it has fifty hours use that is saying a lot since I always have rotated my treasures. This one has not had much use so it is practically a hand picked cherry, as new a TLZ as you will find. This is my opinion. Grado’s OTL, or optimized transmission line, technology provides an ideal transfer of signal from the surface of the LP to the generator of the system. Both the Blue2 and Red2 use a four piece OTL cantilever that has a Grado specific diamond mounted on a brass bushing.